NETWORK FINALS: BLINDSPOT gained 0.1 in final numbers, and although the newly-renewed DYNASTY lost 0.1, the resulting 0.2 was still better than its result last week. CABLE HIGHLIGHTS: Sports was once again on top of cable. The early game of ESPN’s NBA doubleheader (Cleveland vs. New Orleans) led the night at 0.56, with the late game (LA Clippers vs. Portland) at 0.37. ESPN2’s WOMEN’S NCAA TOURNAMENT games were at 0.50/0.31. On Discovery, GOLD RUSH dropped 0.07 to 0.39, and BERING SEA GOLD returned at 0.33. 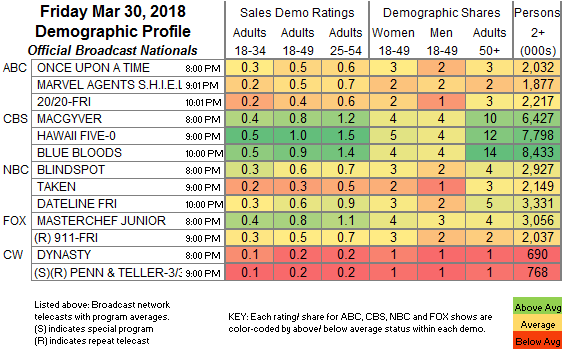 Nickelodeon’s SPONGEBOB was at 0.32, with lead-outs ALVIN & THE CHIPMUNKS at 0.27 and KEEP IT SPOTLESS at 0.23, and lead-in LOUD HOUSE at 0.26, while the network’s noon PAW PATROL was at 0.29. Food Network’s DINERS, DRIVE-INS & DIVES was at 0.30. HGTV’s MY LOTTERY DREAM HOUSE ticked up to 0.27, HOUSE HUNTERS INTL was steady at 0.23, and HOUSE HUNTERS was down 0.03 to 0.23. Cartoon Network’s TEEN TITANS GO was at 0.22. Fox News’s TUCKER CARLSON TONIGHT led the Rachel Maddow-less news night at 0.21/0.35/2.1M, above CNN’s SITUATION ROOM at 0.19/0.25/800K and MSNBC’s LAST WORD WITH LAURENCE O’DONNELL at 0.17/0.26/1.7M. 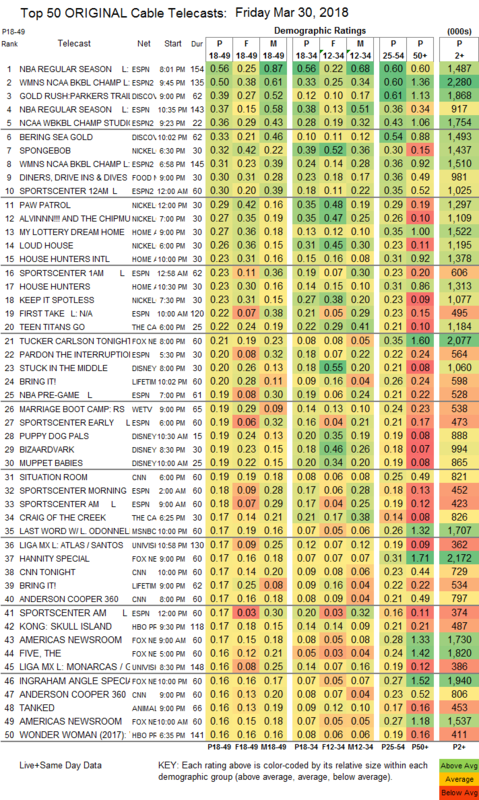 Lifetime’s BRING IT was at 0.20/0.17, compared to last week’s 0.24. On We, MARRIAGE BOOT CAMP ticked down to 0.19, and BRIDEZILLAS was down 0.02 to 0.11. Cinemax’s STRIKE BACK was down 0.01 to 0.02/130K.